An extensive range of teaching and learning opportunities exist for trainees in the South-East Scotland deanery. Details of these will be updated below. Every month we hold a teaching morning which is open to all members or our diverse multi-disciplinary teaching. We cover a wide variety of topics including our morbidity and mortality meetings. 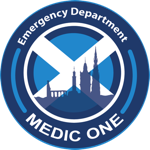 Every month all ACCS trainees are invited to attend teaching afternoons run by our EM consultants. They are focussed on covering all aspects of the ACCS Curriculum and include simulation sessions and mock MCEM exam practice. Every week all higher speciality trainees are released from clinical duties in order to attend teaching afternoons. Teaching is delivered by fellow EM registrars and overseen by our EM consultants. They are focussed on covering all aspects of the EM Curriculum and provide preparation and preparation for FCEM exam.